Today was going to be a driving day, so I nestled into my ‘home’ for the last few weeks (back seat as Cliff had assumed the driver’s role, Ian the navigator role with me as director to specific locations guide) and closed my eyes – the quickest way that I know to make time pass by quickly. When I woke up, we were bouncing along a rather rough track. What had happened? Change of mind, as we were making such fast progress, but on a road with little opportunity to stop, that Ian had found an alternative route that had turned out to be a little longer and significantly slower than had been planned, but still got us to Rio Verde in daylight, where we found a triple room at the Premier Hotel. We made a number of stops along the track, but the images have already been backed up on my plug in HD, so the full details will have to wait until I review these Diary notes and fill in the blanks or make some corrections in weeks to come. S3118: Along MEX 101: Agave lechuguilla, Aloe vera (cultivated) Cylindropuntia leptocaulis, C. sp. 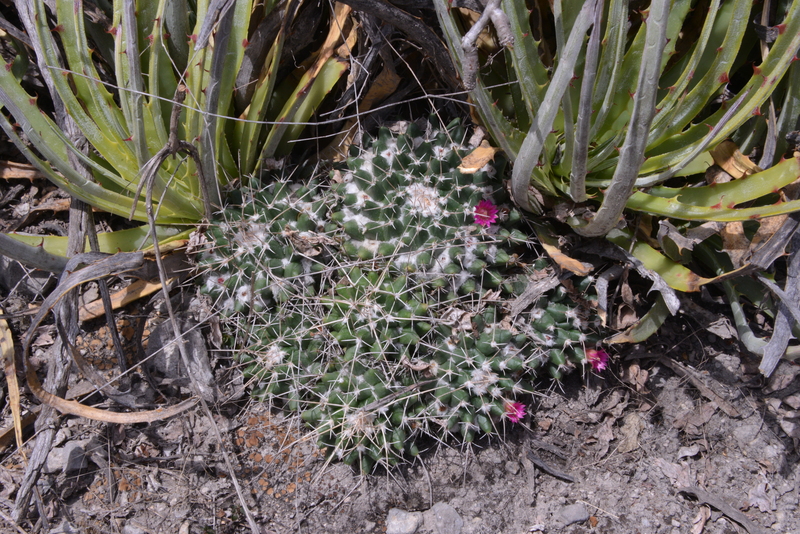 Echinocactus playacanthus, Echinocereus pentalophus, Mammillaria compressa, Myrtillocactus geometrizans, Opuntia microdasys, O. sp., Yucca sp. S3120: Coryophantha maiz-tablensis, Cylindropuntia sp,, Echinocactus platyacanthus, Echinocereus enneacanthus, Ferocactus histrix, Fouquieria splendens, Opuntia sp. Stenocereus (Rittercereus) pruinosus, Tillandsia recurvata. I have to admit to becoming really fed up with the names of my favourite plants changing continuously. 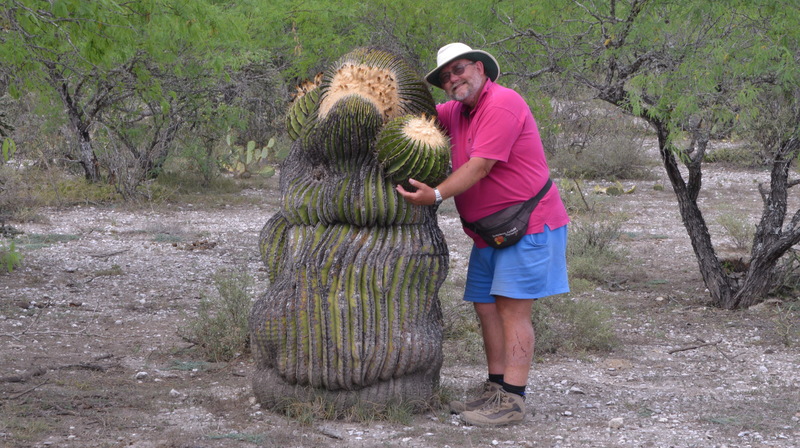 I try to keep up, for the sake of good communication in the Diaries, in presentations and in articles, but names change faster than I can keep up with if Cactaceae Systematics Initiatives are to be believed. Trouble is that at presentations I learn that most people still hang on to Backeberg names – no problem but it would be such a help if we could all stick to one, stable set of names. 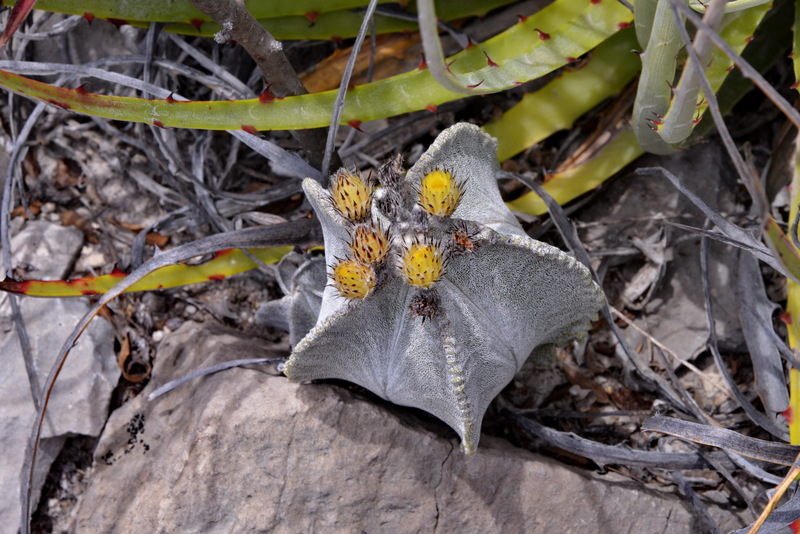 You may have noticed that in attempt to do this, Angie and I have started our own naming system, starting with ‘Smiler’ for a crested Copiapoa cinerea ssp columna-alba that we go and see each time that we pass through the Pan de Azucar National Park in Chile. After parking the car, Angie is able to walk straight through a field of 1,000 + columna-alba, straight up to the plant, so it certainly meets the criterion of being ‘distinct’, and yet there is no intention to suggest that botanically / taxonomically it is a different taxon. Here is my second plant in this naming system (PK#2): meet ‘Fatty’ (a.k.a. ‘Michelinmanii’). Cliff’s pressence in the picture is purely to illustrate that there is no truth in the opinion that cactus explorers are the biggest threat to plants in habitat. We could not move most, even if we wanted to! 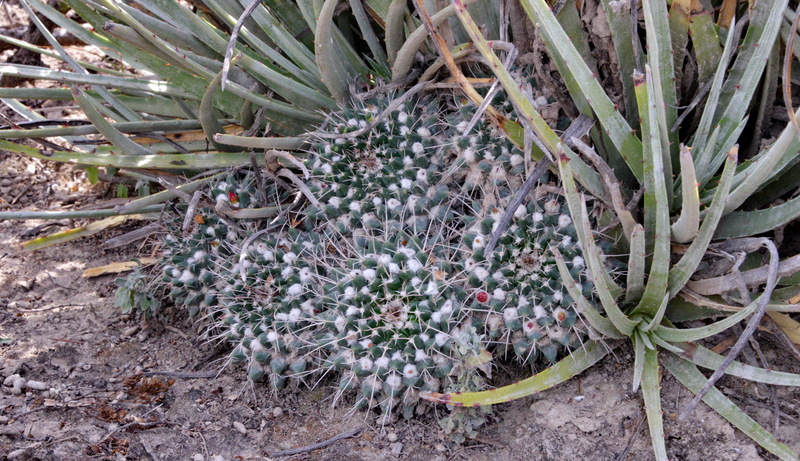 In the ‘old system’ it is still known as Echinocactus platyacanthus. Tomorrow we’ll meet PK#3. 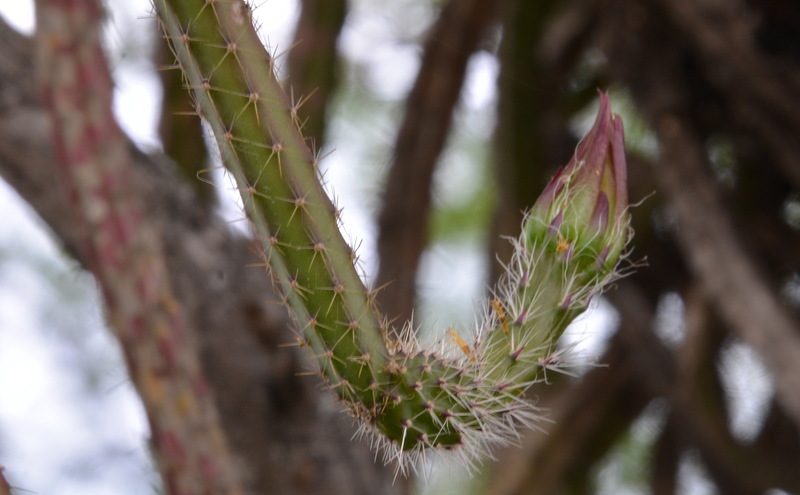 The plant above looks remarkably like ‘Aporocatus flagelliformis’ that we used to grow at the Holly Gate cactus nursery in the 1990s, except those plants tended to have their flowers nearer the base of the stem, rather than at the end like this one. Holding the branch to prevent the stem swinging in the breeze produced evidence that the plant had the same glass-wool like spines that I’d have in my fingers after repotting a few hundred plants for Terry Hewitt. The track seemed familiar – was it the same track that Eunice Thompson and I had followed in the opposite direction in 2011? Yes, it was, but how did we miss the plants that we saw this time? That time we picked up a puncture and ended up buying a new tyre in Ciudad Victoria. This time we had no such dramas and promised to go back the next day to revisit some of the stops made in 2011.